Free business card designer software is complete solution to build customized and high resolution post cards, logos in different colors. Reliable ribbon building application is highly interactive tool to design most versatile, sparkling visiting cards without any additional efforts. Freeware image maker program is finest quality utility to produce high quality and valuable identification cards with the help of different image designing tools in single mouse click. Free business card designer software effectively enables users to create ready to print name badges, stickers to fulfill specific organization needs. Proficient sticker producer utility is simple to use and makes several precious, good looking post cards for personal and commercial purpose in few steps. Label generator application is specially designed and developed to create any type of ID cards in 2D barcode font style with various shapes and colors. Free business card designer software is fully capable to generate classic, printable membership cards in very short time period and stores produced labels in computer system. Tag creator program offers variety of graphical objects like star, arc, triangle, barcode, ellipse, pencil, picture, circle, rectangle, line, text etc to build rich quality letterhead. Ribbon building utility is generally used by various corporate sectors including government agencies, telecom sectors, retails, airlines, manufacturing firms, postal services, transportations etc. * Image maker application has many printing and designing features to design eye catching visiting cards. 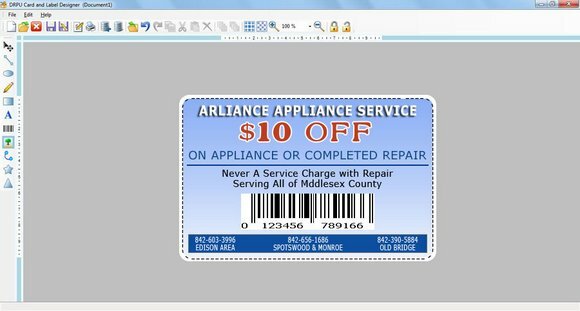 * Free business card designer software creates flexible, dazzling coupons for large, mid and small scale industries. * Sticker producer program permits system user to update color, caption, font, height, size, shapes, width etc of generated stylish ID cards. * Label generator utility provides attractive GUI and supports latest versions of Windows operating system.